Our increasing awareness of such great love in Christ leaves us speaking in superlative expressions, just like Paul! There is nothing that can separate us from the love of Christ Jesus for us, for me, and for you. When I think about Jesus Christ, I cannot help but be passionate about my expression in the revelation of who He is – His beauty, love, majesty, mercy, compassion, and so on and so on. My outward expression of a glorious inward reality of life in Christ – this is Christianity. This is creativity in life. Right now, we may be veiled to His great love. Let’s open our eyes to see His great love for us through the finished work of the cross and His grace. Love is the source of creativity. Know Him and know His great love for you. Creativity will flow abundantly and beautifully in Christ as we live in the revelation of being in union in Him. I want to emphasize that creativity flows from the Creator. In that, I am to be creative in Christ. In being creative, people are drawn to that love flowing through me because of the One who lives in me. 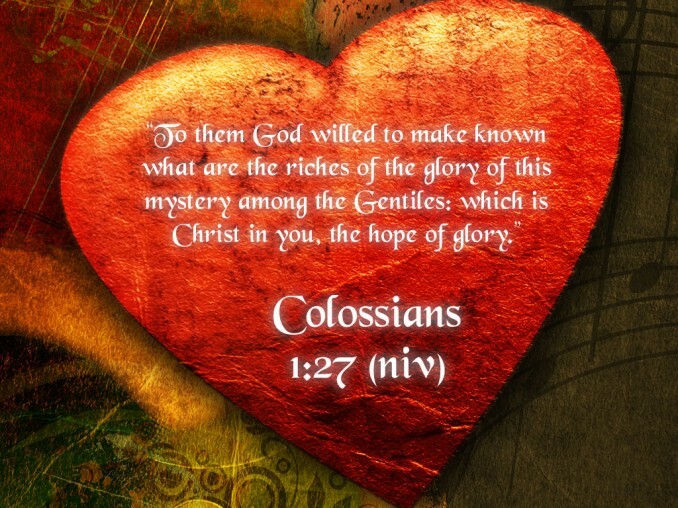 I take no credit other than to enter into His love, receive this by the Holy Spirit and to move creatively in Christ. How to move creatively? Out of the box of confinement due to other’s opinions of you, their rejection of you, or their outright persecution of you. God loves you and accepts you. Out of the box of confinement to do or to be like anyone other than the one whom Christ created you to be. Creativity is flowing out to draw others to the source within you, Jesus Christ. Each of us has a sphere of influence in life. Great joy will flow through our life when we find that in that sphere of the day-to-day, we can be conspicuously creative in our actions. It starts with the simple awareness that we are to be led by the Spirit in the ways He chooses to lead us. That means relinquishing our life to live in His life, the life of Christ. This is not dependent on our ability but on His life flowing through us. There simply is no reason for the Body of Christ to be stagnant, apathetic, or mundane. The only reason is simple and clear. Without Christ being the very center of all we say and do, we are off focus and ineffective. It’s all in Christ. This entry was posted in Uncategorized and tagged believe, Christ, creative, creativity, design, destiny, diversity, expression, flow, focus, freedom, glory, grace, Holy Spirit, in Christ, Jesus, journey, liberty, life, live, love, movement, peace, prophetic, reality by riversofeden1. Bookmark the permalink. This is great…. Open your eyes, clear your ears and allow the creativity of Christ to flow. Just remember…. You must take the first step because the creativity can not flow if you remain standing still! I love what you shared today. I am not sure what to say other than thank you. You are very welcome. 🙂 Thanks for reading it. What a great reminder of the source of our creativity — the limitless Creator. I have struggled with a creative drought lately, and this is an encouraging word. Thanks for sharing. I hear you. Creativity drought is sometimes God Himself calling us apart to worship. In looking at the face of Christ, we stand in awe and our creativity to write, paint, play, or whatever is restored and renewed. I am also walking in the revelation of this and it keeps hitting me over and over. Thanks for the great comments.